There are several wonderful cities located around Richland Chambers Lake. The City of Corsicana is the county seat for Navarro County. The Tejano leader, Jose Antonio Navarro, who signed the Texas Declaration of Independence, is the county’s namesake. Navarro was a leader in the Texas Revolution. As of 2007, Mildred’s population was 448 people. Since 2000, it has had a population growth of 10.62%. The median home cost in Mildred is $133,100. Home appreciation the last year has been -0.41%. Compared to the rest of the country, Mildred’s cost of living is 23.53% Lower than the U.S. average. Mildred public schools spend $5,456 per student. The average school expenditure in the U.S. is $6,058. There are about 13 students per teacher in Mildred. Eureka is at the junction of U.S. Highway 287 and Farm roads 637 and 3243, eleven miles southeast of Corsicana in southeastern Navarro County. The settlement developed around a log schoolhouse known as Dunn’s School just before the Civil War. It is served by the Mildred Independent School District. The population as of July 2007 was 375. 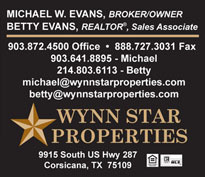 Kerens is a growing and friendly Central Texas city conveniently situated between Corsicana and Athens on SH 31. The city lies about 70 miles southeast of downtown Dallas and some 180 miles from Houston. Kerens was incorporated in 1881. The Texas & St. Railway built a narrow gauge line through Navarro County and surveyed a townsite, which was named for an official with that railroad. Trinity and Brazos Valley Railway in 1905, and settlement began the next year. The town was named for Judge Sam Streetman of Houston, a surveyor for the railroad, who also surveyed the town.